Which Group Is More Despicable, IRS Bureaucrats or the Politicians who Created the Tax Code? The title of this post is sort of like the age-old question of what came first, the chicken or the egg. Should we blame politicians for our corrupt, loophole-ridden, abusive tax system? Or should we focus our ire on the IRS, which seems to go above and beyond the call of duty to oppress innocent people? I’ve generally directed my hostility to the politicians, but the latest IRS scandal is leading me to reassess my views. 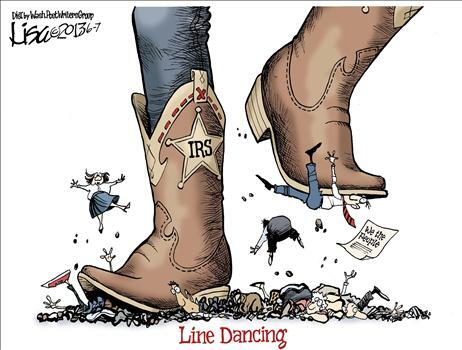 This Lisa Benson cartoon captures the mentality of the tax collection bureaucracy. The problem isn’t that the IRS wasted money at boondoggle conferences. Every government agency and department pisses away money in a frivolous fashion. We should be far more worried about the IRS’s callous disregard of the Constitution and Bill of Rights. I’ve said many times that fundamental tax reform is the answer, but that’s only part of the story. So long as we have a big and bloated government, the politicians are going to want some sort of oppressive bureaucracy to extract several trillion dollars of our money every year. So if we really want to clip the wings of the IRS, we better figure out how to restore limited, constitutional government.